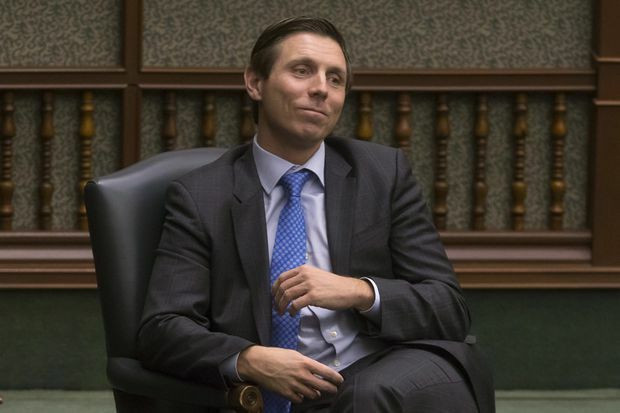 Former Ontario PC Leader Patrick Brown sits in his chair as an Independent MPP as he listens to Provincial Finance Minister Charles Sousa deliver the Ontario budget at the Queens Park Legislature in Toronto on March 28, 2018. Former Progressive Conservative leader Patrick Brown broke Ontario’s ethics rules by failing to disclose a $375,000 loan from a close friend who later went on to become a Tory candidate, says the province’s integrity watchdog. The Office of the Integrity Commissioner launched an investigation into Mr. Brown’s financial affairs in February, in response to a complaint by Randy Hillier, a Tory MPP. Mr. Hillier cited, among other issues, a Globe and Mail report that documented a proposed $375,000 deal in June, 2016, between Mr. Brown and Jass Johal, a paralegal in Brampton, Ont. One month later, $375,000 was deposited in Mr. Brown’s personal bank account, shortly before he purchased a $2.3-million waterfront home. In the Globe story in February, Mr. Brown said in a statement that he “received help” from his family to purchase the home. A spokeswoman said at the time that Mr. Brown’s mother had provided that assistance. The integrity probe in effect ruled that Mr. Brown hid the true source of the financing of his home. According to the Integrity Commissioner’s report, however, Mr. Brown did not get help from his family for the down payment. The report says “no specific plans were made for his mother to provide him with assistance.” It also does not appear that Mr. Brown sought assistance from any other family member, the report adds. In fact, Mr. Brown borrowed the money from Mr. Johal to help with a down payment on the house, Integrity Commissioner J. David Wake revealed in a report released Thursday. The report also says Mr. Brown was “less than transparent” when he provided documentation to the bank where he obtained a mortgage. “The arrangements made by Mr. Brown to secure a down payment for his purchase of the property … were Byzantine in nature and disturbing on many levels,” Justice Wake wrote. He has reprimanded Mr. Brown for failing to disclose the loan and rental income from his house. Mr. Johal did not respond to an e-mailed request for comment. However, that same affidavit, dated June 11, 2016, was provided to Mr. Brown’s mortgage specialist at Toronto-Dominion Bank on July 18, 2016 – five weeks after he had cancelled the asset sale, the report says. TD Bank had advised Mr. Brown that it preferred that the $375,000 should come from either an asset sale or a loan from a family member, the report says. TD spokeswoman Cheryl Ficker declined to comment. The other reason is that Mr. Brown must have known that the “revelation” of his indebtedness to a future PC Party candidate could be construed negatively, he wrote. Five months after Mr. Brown borrowed the money, Mr. Johal was acclaimed as the candidate for the PC Party in Brampton North, a new riding in the suburban 905 region around Toronto. Mr. Johal, who described Mr. Brown as being “like family,” also served as an adviser to the former PC leader, who was forced to resign in January over allegations of sexual misconduct. Mr. Brown has denied the allegations. Justice Wake says it “seems likely” that Mr. Brown knew Mr. Johal intended to seek the nomination at the time the loan was negotiated, given that the two men spoke at least weekly. Mr. Brown said he was not aware that Mr. Johal planned to run. But Mr. Johal said he told him about this in 2015. However, Justice Wake says he “cannot find on the evidence before me” that Mr. Brown intervened in the nomination. Doug Ford, who succeeded Mr. Brown as PC Party Leader, has overturned four nomination races, including Brampton North. Documents shown to The Globe in February reveal that Mr. Brown deposited $375,000 into his bank account on July 11, 2016. Later that month, property records show he purchased the five bedroom house on Lake Simcoe’s Shanty Bay. He took out a mortgage of $1.72-million from TD Bank. The terms of the loan from Mr. Johal were set out in a promissory note, signed over lunch on June 26, 2016. Snover Dhillon, a friend of both men who helped Mr. Johal land the nomination, witnessed the note. Under the terms, the interest rate was 4 per cent a year, payable monthly between August, 2016 and July, 2018. However, Mr. Johal did not receive any interest payments until a few days after The Globe story revealing the dealings between the two men. But it wasn’t Mr. Brown who made the payments. Rather, his mother, Judy Brown, signed two cheques for $4,000 each on March 1 and April 1 of this year, Mr. Johal told the commissioner. Mr. Brown said his mother has actually paid out $12,000 in interest over the past six months.